RECORD SETTING ENDURANCE FLIGHT This photo was taken shortly after touchdown of the endurance flight of the Packard Diesel powered Bellanca on May 28, 1931. It shows, left to right, the pilot Walter E. Lees, the N.A.A. 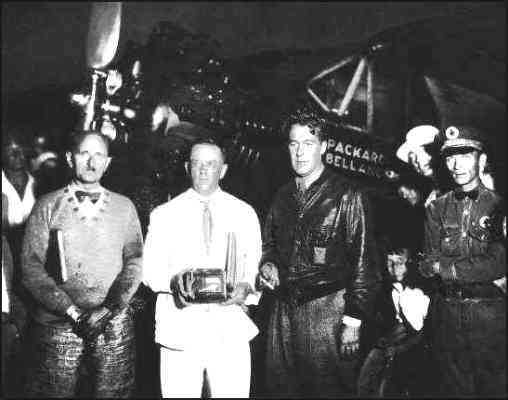 Official Observer Dr. Ralph N. Greene, the co-pilot Fred Brossy, an Unidentified person and the Texaco agent who had furnished the diesel fuel for the flight. Let's Get Ready 1931 The Packard Motor Company gave Walter Lees and Frederick A. Brossy permission to attempt to break the non-refueling record of 67 hours, 13 minutes, held by two Frenchmen, Maddelena and Creeorni. The 225 HP Packard Diesel engine that Captain L.M. Woolson and Dipl.Ing. Hermann I.A. Dorner had designed was placed in a specially built Bellanca. Woolson had advocated the endurance flight before his death and outlined many of the plans which were carried out in the actual flight. In spite of elaborate planning, the first attempt failed. 55 Years Before Voyager 1931 The Packard Motor Company, a conservative, safety-first company, was understanding about the failure. They wired approval to try another attempt. In the second attempt, on April 12th, The Packard-Diesel Bellanca took off with a gross load of 6,666 pounds including 458 gallons of fuel oil weighing seven pounds per gallon. The total cost of the fuel was $45.80. The second attempt failed due to bad weather.On the third attempt, they successfully established a new endurance record of 84 hours, 32 minutes. Walter's dream to become a famous flyer had more than come true. He had broken a World's Record. DR. RALPH N. GREENE, PIONEER Dr. Ralph N. Greene, physician, pilot, medical examiner of the Department of Commerce, president of the Aero Medical Society of the United States, first flight surgeon of the National Aeronautic Association, observer for the National Aeronautic Association, and a friend to all fliers and things aeronautical. ONLINE RESOURCES If you search for "Ralph N. Greene", using the Google search engine, (7-6-04), you will find about 7 links. Most of them offer only a limited amount of information. Greenville, Madison County, Florida This page offers the basic information as to the dates of his birth and his death. It also mentions that there was a bronze WW I medallion which was gone in 1989.